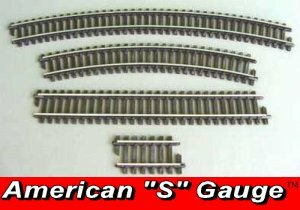 American "S" Gauge track is code 172 precision rolled Nickel-Silver T rail. The solid Nickel-Silver rail comes weathered and has excellent electrical conductivity. The rail is a copper-nickel alloy which is superior in corrosion resistance. It can be easily soldered and does not corrode, rust or oxidize making it excellent for use in all locations, from the very humid to the very dry. The solid rail absorbs sound better and makes for smooth quiet train running. The scale-sized plastic ties are molded from UV resistant high quality ABS plastic and have a realistic wood grain pattern, color, height, width, length and spacing from real main lines that adds to the prototypical look of the track in a realistic fashion. The track is accurately gauged for precision top-notch performance. The weathered rail joiners have a detailed six bolt head design and come installed from the factory on all track and switches for proper electrical conductivity. A snap lock system securely holds the track sections together to ensure exact alignment and good electrical contact. 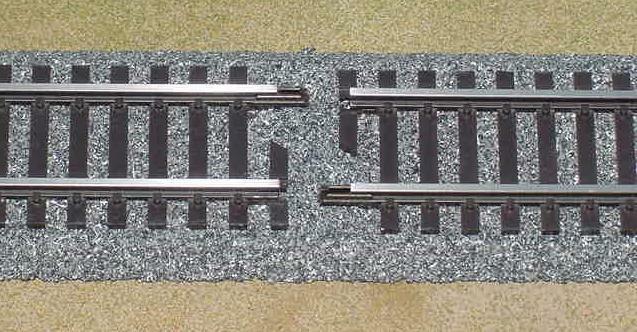 When the track sections are joined together the tie spacing remains uniform and this appearance is an exclusive design found only with our track system. The 60" flex track bends easily to an infinite variety of curves with no templates or bend fixtures. Switches are closed frog allowing for operation of all S gauge wheel flanges. Simply by removing some plastic ties from the track you can mount original AF Gilbert uncouplers, track trips, and mail pick-up stand. Same radius as original American Flyer© track 12 curved, 19" radius (38" centerline diameter), 4 straight (10" long), one pair power feed rail joiners with wire leads. 12 curved, 27" radius (54" centerline diameter), 4 straight (10" long), one pair power feed rail joiners with wire leads. realistic effect. 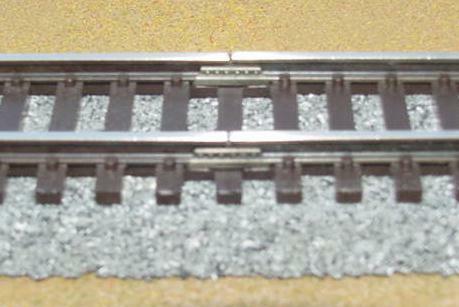 Ballast per pound normal coverage for roadbed is 10-12 feet but can vary depending on height and width of roadbed. 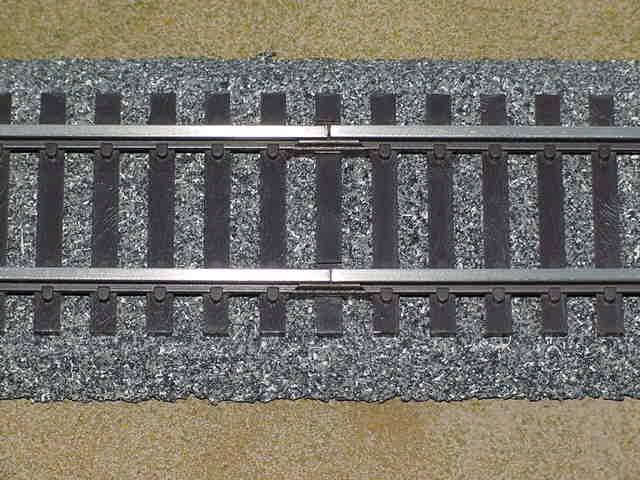 Ballast color will depend upon the section of country your railroad operates in. to fastening down the track ties. S-gauge wheel flanges in S-gauge railroading. 2) All rail comes pre-weathered and is solid code .172 Nickel/Silver. conductivity between rail and wheel. 5) This solid rail makes for quiet train running. 6) Ties are molded from UV resistant, high quality ABS plastic. prototypical look of the track in a realistic fashion. found only with our modular track system. to an infinite variety of curves with no templates, bend fixtures or special tools. wheel flanges, Tinplate, Hi-Rail and Scale. We, and our customers believe this track to be the best and the most realistic. fully assembled, ready for easy installation. Input power must be 14-18 volts AC with a minmum of 40 watts. with high quality components for trouble free operation. Switch motor can be easily removed with six screws. Can mount other makes for under the table installation. straight position, or Red for curved position. This switch document shows data which is the property of Classic Trains and is not to be copied, reproduced, published, submitted to others, or used for manufacture without the specific written consent of Classic Trains. All proprietary rights and the rights to its request are retained by Classic Trains.